Meet Dr. Iyman | Bronx, NY | Jason Gordon, D.D.S. 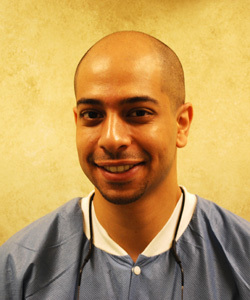 Dr. Iyman Elashmawy graduated from NYU College of Dentistry with a Doctor of Dental Surgery Degree in 2006. In 2009, he received his Post Graduate Periodontics Residency and served as Chief Resident. He earned a top clinical resident award. Dr. Elashmawy is proficient in all aspects of periodontal surgery, implants, guided tissue/bone regeneration, lateral window sinus elevation, osseous surgery, esthetic/functional crown lengthening and soft tissue periodontal plastic surgery. He is also Invisalign certified. Dr. Elashmawy has lectured at the Greater New York Dental Meeting, Grand Round NYCCD Meeting and at the Tri-School Periodontal Conferance.